Zambia has recorded good growth in the 2000s after receiving debt relief of US$224 million from the IMF/World Bank in 2005 – this released it from 80% of its annual debt-service commitments. Macroeconomic stability and sound fiscal policies have produced a GDP growth rate of 6.4% per annum (2006-10), though Zambia’s GNI per capita still remains at US$1,070. Agriculture is still an important part of the economy, accounting for 20% of GDP, but the services and industry sectors are becoming increasingly important contributing 44% and 36% of GDP respectively (2010). In the agriculture sector, the majority of people living in rural areas are engaged as subsistence farmers; maize is the staple food. There is a significant commercial agriculture sector, which in the 2000s saw steady growth in the production of cotton, fresh flowers, soya, tobacco and vegetables, mainly for export. An estimated 300,000 people are employed throughout Zambia in fisheries, fish-farming and fish-selling. The country has no access to the sea, but it does have 15 million hectares of inland water, including coastlines on lakes Kariba and Tanganyika where the principal fisheries are located. The most commercially important fish species for fisheries are sardines and lates; and for fish-farming, various species of bream. The construction sector contributes 16% of GDP, this is due to very strong growth in construction activity during the 2000s, mainly because of major investment by government and aid agencies in infrastructure, particularly roads and bridges, but also as a result of private investment in copper mining. The manufacturing sector contributes 10% of Zambia’s GDP. The government has privatised state-owned industries and encouraged foreign investment, and the main products of the growing manufacturing sector include foodstuffs, beer and spirits, tobacco, clothing, textiles and footwear. Zambia’s modest requirements of oil and gas are imported. But traces of oil were discovered in 2007 in three of the country’s provinces, particularly in the west adjacent to Angola. 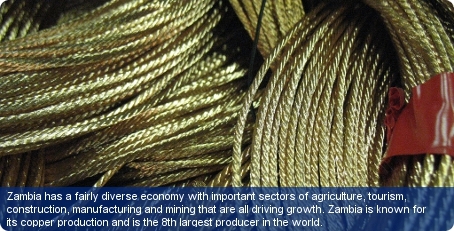 The country was one of the most prosperous in Sub-Saharan Africa until the collapse of copper prices in the mid-1970s. This landlocked country’s transport network was also crucially disrupted by civil unrest or liberation wars in the surrounding countries of Angola, Congo, Mozambique, Namibia, South Africa and Zimbabwe. The country also continues to remain vulnerable to fluctuations in copper prices and to the ever-present threat of drought. About 22% of the 91,000-km road network is paved and there are two railway systems, the narrow-gauge Tanzara Railway, running from Zambia to the Tanzanian port of Dar es Salaam in the north-east; and the southerly system to Harare, Zimbabwe, and onwards to the ports of Beira in Mozambique and Durban in South Africa. The international airports are at Lusaka, Livingstone, Ndola and Mfuwe. Zambia is ranked 8th in the world for getting credit, according to the World Bank’s ‘Doing Business 2012’ study. It is also 7th in the sub-Saharan African region for ease of doing business above countries like Kenya and Nigeria. These rankings measure the conduciveness of a regulatory regime in starting and operating a business. Zambia has a 75% literacy rate among people aged 15-14 (2010) and English is generally used in professional and business life. Following extensive privatisation, the majority of those in formal employment are now employed in the private sector.